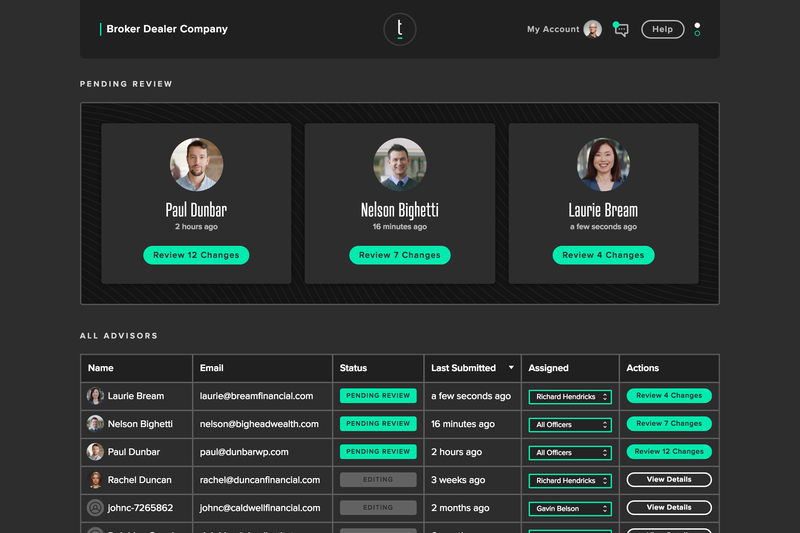 Just three weeks ago, we introduced Providence V2, a platform built specifically for Broker-Dealers and compliance teams to make the work between compliance and financial advisors more seamless. As an extension of the Twenty Over Ten platform, advisors can create custom, tailored websites with built-in, one-click compliance features to ensure all changes are reviewed and approved. We’ve worked closely with Broker-Dealers and compliance groups to determine what processes and tools are necessary to seamlessly review, communicate, and approve changes for their respective financial advisors. 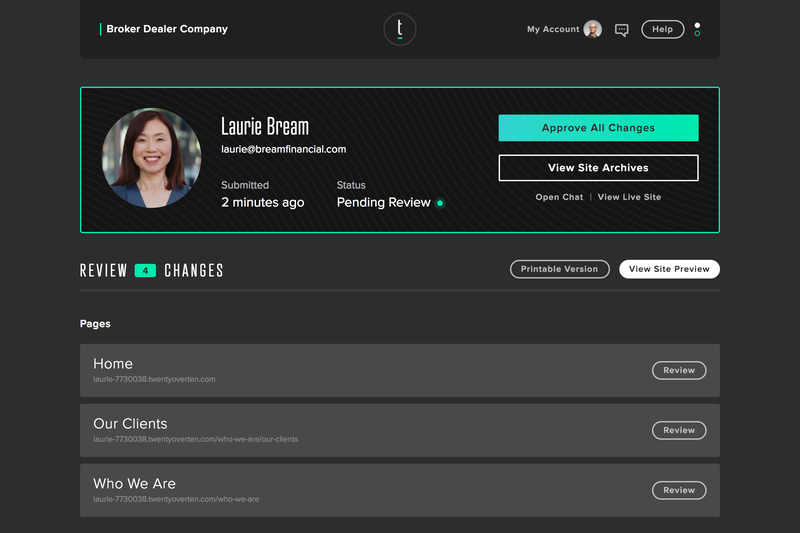 We’ve also iterated on our product and added extra features that make it the best website and marketing review tool out there for compliance teams and the advisors they serve. With Providence, the process of building your team, reviewing content, and communicating with others throughout the compliance process is easier than ever. You’ll have access to a private website URL, print-friendly documentation, as well as a robust compare tool to identify changes. All websites updates must be approved in order to publish. Talk directly with advisors via live chat, send attachments or URLs, view archive history, and get notified of new changes & messages. 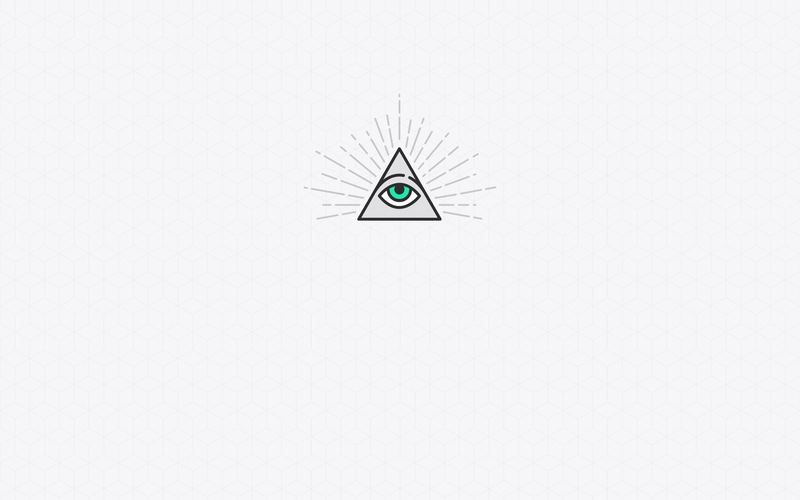 All chats are also archived. How will this benefit advisors at your Broker-Dealer? Advisors are demanding to be able to market themselves effectively, without using template-based website design where everyone looks the same. With Twenty Over Ten, your advisors will stand out, as each website is tailored to the advisors’ unique brand. Each has the option to build a website themselves or work with our team of expert designers to create a tailored website that best fits their goals and objectives. Advisors can easily secure visitors’ connections to their website and boost their ranking in Google search results through our free, automatic SSL certificates. We take care of all the details and provide the certificates at no additional cost. Advisors can create, edit and share updates through our website editor. Easily publish (with compliance approval) new blog posts or store them as drafts to post at a later date. Advisors can create multiple blogs in a single website, update and categorize posts for searchability, and control social sharing capabilities. Users are able to create unlimited landing pages that can be customized to niche markets, enhance lead generation, or further engage current clients. All Twenty Over Ten websites meet the highest w3 standards and are completely mobile-responsive. New SEO Tools include meta-data for all pages (blog posts included), customizable URLs for pages and posts, image alt tags, and more. The Twenty Over Ten platform features the most modern in-page editor further simplifying content management for all users. Between our robust Support platform and attentive team of agents, advisors (and compliance teams) receive white-glove service every step of the way at no extra cost. Interested in learning more about Providence or want to try it out for yourself? Contact us at hello@twentyoverten.com to book a demo or to get started.